End-to-end protection for your virtual and physical workloads, databases, applications and storage with a single, simple web-scale solution. Eliminate legacy backup silos and radically simplify operations with a single UI. Rapid recovery points and instant recovery help meet your business SLAs. Deploy anywhere, scale-out limitlessly and eliminate forklift upgrades. Radically simplify backup and recovery by eliminating legacy infrastructure silos while reducing data protection costs by 70% or more. Eliminate separate backup software, target storage, proxy and media servers and cloud gateway with a hyperconverged solution. One UI to manage and provision all your data protection services, spanning from the core to the cloud and edge. Easily assign policies to one or all jobs globally to automate operations and meet your business SLA requirements. Enjoy consistent and comprehensive enterprise-class data protection for your business-critical applications and databases, virtual and physical workloads, NAS, SaaS and public cloud environments. Data protection depends upon timely backups, fast global search, and rapid recovery. Cohesity DataProtect reduces your recovery point objectives to minutes. Unique SnapTree technology eliminates chain-based backups and delivers instantaneous application or file-level recovery, with a full catalog of always-ready snapshots even at full capacity. Dramatically reduce recovery time with unlimited and fully hydrated snaps, without any performance impact. Unique global actionable search across all workloads and locations from a single UI. Recover individual or hundreds of VMs and files, plus application objects instantly. Take advantage of public cloud elasticity and economics with our cloud-first design. Eliminate tape and choose your preferred public cloud provider for long-term data archival. Enterprise-grade backup and recovery for cloud native applications. Replicate data and apps to the public cloud for disaster recovery or test/dev. Optimize your backup and recovery infrastructure and gain maximum storage efficiency with the enterprise-class capabilities of Cohesity DataProtect. Industry leading space efficiency with true global variable length deduplication across workloads and protocols. Meet SLAs and achieve higher data resiliency with strict consistency, erasure coding and two node/disk fault tolerance. Protect your data with AES-256 encryption, multi-factor authentication and FIPS certification. Seamless archive to the cloud has enabled us to leverage the cloud for an archive use case that wasn’t rocket science and without breaking our budget. Cohesity addressed our biggest backup and recovery concerns by providing fast, resilient and reliable enterprise data protection for our growing company. We have tight windows in the hospitality industry, and Cohesity was able to perform a complete backup in one third of the time of our previous solution. Cohesity’s capabilities, such as native integration with Microsoft Azure, have been a huge bonus for our overall operation and application development. Cohesity helped us to easily backup the growing critical and mandatory to save data, like police department videos from their vehicle and body cameras, and made those files instantaneously available upon request. 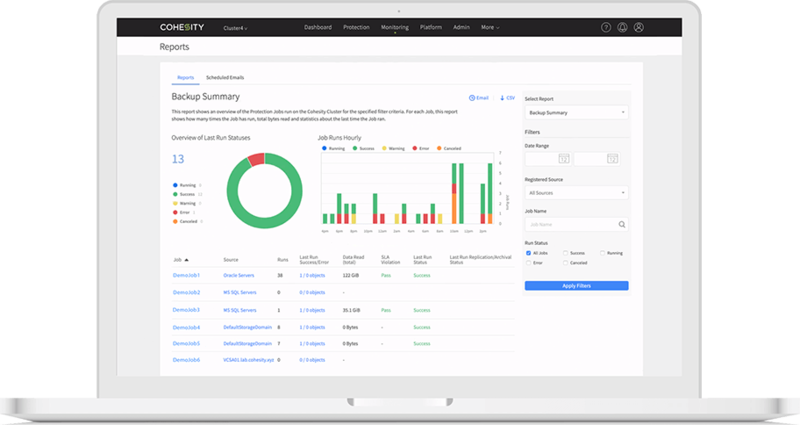 From backup to recovery, analytics to monitoring and alerting, Cohesity consolidated everything under a simple, easy to access user interface.